The party was tonight. It was the Dougan Leap Year Doughnut Party. Peering into the doughnut case this afternoon, we nabbed two glazed ones, two white frosted sprinkled ones, and one filled with raspberry jelly. On the way home, Morgan and I laughed and talked, with me purposefully reigning in my own expectations. Upstairs around the dining room table, the five of us clambered into chairs. Two plastic cases of strawberries and blueberries sprawled open invitingly, and the five doughnuts gleamed beneath a translucent panel in the cardboard box. Cracking jokes and tossing berries into our mouths, we stopped to pray, and then we began. Two slim paper envelopes held our attention, and I slid my finger under the seals, drawing out multiple sheets of paper. "Morgan, here's yours from 2008. John, yours." "Look at how small our writing was then!" "I only wrote three lines!" another exclaimed. "Here's a drawing I did," she pointed, laughing. "Who wants to read theirs first?" I asked. One by one, we took turns reading our handwriting from eight years ago. In childish print, we heard echos of their younger voices pour off the page. "Here are your 2012 letters," I said, handing across folded handwritten sheets of paper. "For Morgan only" one of them read in green ink pen. They reached out eagerly, unfolding longer notes written from themselves just four years earlier, and silence dropped in the dining room. Daniel shuffled uneasily. "You were only three years old then, but here is a photo of you from then," I replied, unwrapping the accompanying photos, creased from four years in an envelope. I confess I've been looking forward to this day for years and months! Unwrapping paper, we got to unwrap our lives from eight and four years ago. In time capsule format, we peeked back into who we were four years ago, seeing how we've changed and how we've stayed the same. Taking turns, my kids read their letters aloud, their younger selves asking their older selves questions about what life is like now, casting imaginative questions from the past. "Do you have your own car? Are you living in your own house?" a twelve year old John asked his twenty year old self, and we laughed at what a third year college student's life really looks like. And then my favorite part began: a reflective silence fell as everybody grabbed pens and sheets of paper. Writing from 2016, they talked to their 2020 self, presenting life from this angle and wondering about life four years in the future. Scribbling messy black words across blue lined paper, I wrote my own letter, summing up the last four years, and speculating about the next four. And it couldn't fail to hit me. My choices now affect who I am then, and my mood turned more introspective as I continued to write. Hi friend, if you're not receiving my posts by email, welcome. Simply enter your email address in the box under my bio at the top right of the page. Don't miss an article and be part of any special invitations too. Cool idea Jennifer. Mine are way past that point. As am I. LOL Four years from now I will be 67 and hoping to be walking. Any occasion's the right occasion for donuts!! But I truly love this family tradition that you've begun, Jennifer. Your family will long remember this specific gathering ... and no wonder! Hi Jennifer! Oh my gosh, I love this idea!! I hope you save every single one and get it into a scrapbook. I have never heard of this tradition before, but I'll be sure to pass it on to anyone who will listen! Which donut did you eat??? Wow... That's one of the coolest things I've heard of. What wisdom and discipline to do it and pull it off it takes. You're kids are blessed to have you and your husband as parents. A Godly wife and mother. Good job, Jennifer. Wish I'd have heard or thought of something like this when my kids were young. I'm gonna share this with my kids so that they'll be able to do it with theirs. Bill, (laughing) you'll still be walking in four years, I'm sure. :) And this Leap Year letter or journaling and thanks is never too late. Linda, we had so much fun with it. Glad you could stop be here. Thanks. yes, I'm saving them all and have loved it. I can't wait to read them in 2020. My doughnut was a clear glazed sugar one...mmm. Floyd, yes, your kids are welcome to do this Leap year thing. They should! It's been so much fun. You and your wife could join them too. I've found it's a little bit like a journal and God reassessment time put away in a time capsule. 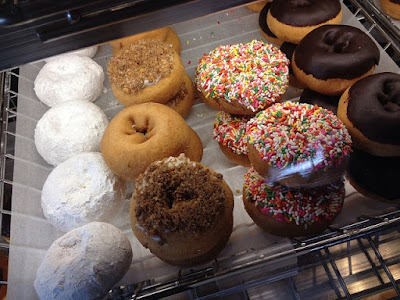 I'd love to have you come share a chocolate doughnut with me! :) Wouldn't that be fun? Thank you! It's been so fun. You and the kids and grandkids could do it too! So, they're moving. huh? Drat! We're excited for them, but wish it was closer. How are you? What have you guys been up to lately? We're excited for them too, but sad they'll be farther from us. =) We're doing good...we get to have the kids come over this weekend, so their parents can have a little stay-cation. Sounds like the weather will be great again! This has been a pretty great winter, weather-wise. Unless you were wanting snow.